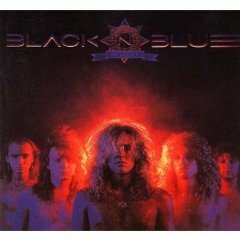 BLACK ‘N BLUE – 1988 ALBUM “IN HEAT” AND BLACK ‘N BLUE… TODAY! I made a rediscovery of a Heavy Metal band and album. Black ‘N Blue is the band, In Heat is the album. Just last week, I was in my 2000 Ford Tauras running errands. Realizing that my urge to hear some Heavy Metal was peaking, I began to rummage through the car glove compartment for some cassette tapes… that is cassette tapes – you just read. Understand that I was not rummaging for a cassette tape while I was driving, the car was in park. This car of mine does not have a CD player, (back in 2000, the auto industry was not regarding CD players as part of any standard equipment, obviously). So, instead, my trusty 2000 Ford Tauras has a built in cassette player instead. That is… a cassette player – you read. I have not listened to this Black ‘N Blue cassette for quite some time, so it proved to be quite a cool listen. While I have listened to In Heat a few times since last week, I cannot help but be grateful for not getting rid of my Hard Rock and Heavy Metal cassettes. Quite a bit of titles are rather pricey on CD nowadays, being imports or out of print altogether. In Heat is selling for around $27 on Amazon Music as an import CD… now that is reason enough for me to hold onto this cassette and play it on my car stereo and combo home stereo – until it wears out. Gee whiz… import regardless, sometimes the prices out there for Heavy Metal CD’s border on the outrageous. #1 Reason why Black ‘N Blue and this album, uh, cassette Rocks hard is – Tommy Thayer on lead guitar. KISS was in his future then… who would have predicted that? #2 – Genes Simmons produced In Heat. Believe me, you can tell… song structure and power. #3 – Jaime St. James on vocals. He doesn’t whine when he sings and the flamboyancy and bad boy image of Heavy Metal just resonates from his voice. In other Metal words… a classic front man. #4 – There are no sappy songs to be heard on In Heat. Stranger is about as close as it gets here… and I really like this song, a power ballad that, uh, Rocks. #5 – Each song is saturated with enough hooks and grooves that it is flat out – ridiculously great. #6 – Did I mention Tommy Thayer on lead guitar? #7 – It’s all about the songs, man. Infectiously good songs all, on In Heat. #8 – How can I not get enthusiastic about a song as good as – Get Wise To The Rise? In a Metal nutshell, In Heat should be considered as a late 1980’s Heavy Metal listening experience of dual guitars, anthems and power slick songs. Riffs abound on In Heat… for all of you riff addicts out there. Woop on guitar proved to be no slouch either. Patrick Young on bass guitar and Pete Holmes on drums make for a dominant rhythm section, very good at what they do on In Heat. Listening to Black ‘N Blue on In Heat, gives me the impression that they had a real good time making this album. Hopefully that was the case. If you are looking for a patented good time Heavy Metal album… well then it is In Heat. Black ‘N Blue made a name for themselves for sure, rediscovering their sound again and listening to In Heat makes this Metalhead… Metal content. 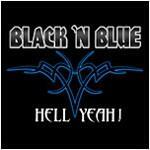 Black ‘N Blue is currently planning to finish and release a new album, titled: Hell Yeah! Look For This New Black ‘N Blue Album In 2010! This is what the Import CD cover of In Heat looks like . My cassette front cover only has the band logo that you see in this import version, (no band photo). This entry was posted on December 16, 2009 at 4:07 am and is filed under 1980's hair metal albums, 1980's hair metal bands, 1980's heavy metal albums, 1980's heavy metal bands, 1980's heavy metal music, 1980's heavy metal songs, current heavy metal bands, Hair Metal, hair metal albums, hair metal bands, hair metal music, heavy metal album review, heavy metal albums, heavy metal albums 1988, heavy metal bands, heavy metal guitarists, heavy metal history, heavy metal music, heavy metal music 1988, heavy metal vocalists, metal odyssey, Music, new heavy metal music, old school hair metal bands, old school heavy metal, rock music with tags 1980's hair metal bands, 1980's heavy metal albums, 1980's hair metal music, 1980's heavy metal bands, 1980's heavy metal music, 1980's heavy metal songs, black 'n blue, black 'n blue 2009, black 'n blue hair metal band, black 'n blue hell yeah album, black 'n blue in heat album, black n' blue heavy metal band, heavy metal album review, heavy metal albums 2010, heavy metal music, heavy metal music 2010, jaime st. james vocalist, metalodyssey, Music, old school heavy metal bands, old school heavy metal music, patrick young bass guitarist, pete holmes drummer, rock music, tommy thayer guitarist, woop guitarist. You can follow any responses to this entry through the RSS 2.0 feed. You can leave a response, or trackback from your own site. 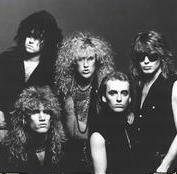 besides their contribution to Metal Massacre 1 with Chains Around heaven, I never got into these guys. i met their drummer a few years ago as he is Michael Schenker’s drummer.